Let her know you've been thinking about her without having to say a single word. 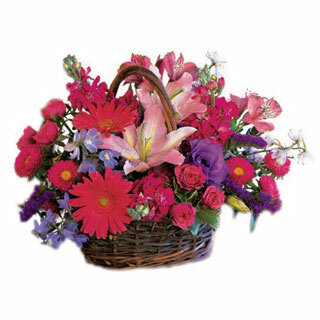 When you send this contemporary arrangement with its bright colors and large, bold flowers, she'll know it in an instant. In the Chic Blooms basket, she'll receive an arrangement with hand-selected lilies, gerberas, alstroemerias, and other seasonal flowers. For anyone who is young at heart, this basket is sure to delight. PLEASE NOTE: The colors of certain flowers may vary depending on availability.